As a UN Youth Volunteer, I am extremely glad I have the chance to be exposed to this world of innovations for development, as I believe technology can aid us to get better insights into society and tailor our response to its needs more effectively, with a fraction of the cost that would have been needed before. I am also excited about the potential cooperation on some technical aspects of our Big Data initiative with volunteers from around the world through the UNV Online Volunteering platform. Prishtina, Kosovo: Building on our achievements with the foresight exercise for unemployment in Kosovo, our innovations team at the United Nations Development Programme (UNDP), which I am part of, is now moving on to the Big Data realm. Every day, people around the world are generating massive amounts of data that, when aggregated and depersonalized to protect the privacy of each one of us, can be used to get insights into the state of society and enable us to respond more effectively and efficiently to its needs. As an office, we have been fortunate to be part of the new Big Data for Development initiative of UNDP, bringing together data scientists from the UN Global Pulse, knowledge and innovation experts from the UNDP Istanbul and Amman Regional Hubs, the United Nations Volunteers (UNV) programmes Online Volunteering service, and six UNDP offices - FYR of Macedonia, Kosovo, Armenia, Sudan, Egypt and Tunisia - to set on an exploratory journey to use these big datasets for public good. Among a wide variety of concepts, ranging from electricity usage as a proxy indicator for socio-economic analysis in Sudan, Twitter trends analysis in Tunisia to monitor one of the Sustainable Development Goals, to a climate change early-warning-system through a network of sensors that collect environmental data in Armenia, our team has been exploring how to use anonymized 112 emergency call records to map out hotspots and historical trends that will help identify the patterns of demand for emergency services. With this, we aim to support the emergency response in Kosovo to be more effective, timely and adequate. In our quest, we are partnering with the Kosovo emergency call centres, the Agency for the Protection of Private Data, as well as the data-driven civil society. 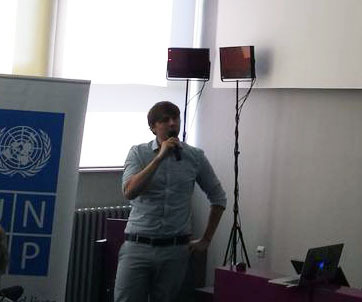 At the beginning of July, along with part of our Big Data team, I travelled to Skopje to attend a Big Data workshop gathering innovation enthusiasts from all participating UNDP offices from the Europe and CIS and Arab States regions, the UN Global Pulse, and knowledge and innovations experts. The workshops objective was to present our initiative, learn about the latest developments and best practices in the use of Big Data for development, refine our concepts, and push our initiatives forward. With this great hands-on experience, and building on the excellent feedback received from all the participants, we now have a better idea of how to continue on our thrilling journey. All references to Kosovo shall be understood to be in the context of UN Security Council resolution 1244 (1999).